If I only had one attitude to pick from, one value to treasure, one concept to choose from, then without a doubt, I’d choose Gratitude. Gratitude is an attitude that I picked up on some 9 odd years ago, although, I heard about it’s value for so many years before that. I incorporated it into my life and I know that it has made the world of difference to how I view life. Today, I’m attempting to write a ‘99 love list‘ but turning it into a ’99 Gratitude list’ instead. Bubble wrap and cello tape – making life easier! I’ve been slacking off on my #everydaygratitude posts, so today I did a combination with Finish The Sentence Friday and Friday Reflections. The hosts are Kristi and this week’s sentence-thinker-upper Deirdre Conran. The prompt : If I only had…..
Also joining Lizzi Lewis and gang for Ten Things of Thankful. Also, happy to announce that Sanch and Write Tribe are now hosting a weekly feature, Friday Reflections, passed on to us by Janine and Mackenzie. Do join us. Lovely idea! So important to remember to be grateful for all the good things. Ahhhh a gorgeous list, and I love the way that almost each item on it has the potential to spiral off into other gratitude items, both larger and smaller than the original. We really, truly are blessed with SO much wonderfulness in this life, and yet sometimes it seems so easy to forget or turn a blind eye to what we have. Ha ha..I think I’ve got a few hundreds more to go as well, Lizzi. Thanks for stopping by! I do, Abbie. Thanks for stopping by. Thanks, Rabia. Oh they teach us so much about ourselves, don’t they? Love your huge list! My first thought was “wow, wonder if I could come up with that many.” And I’m happy to say the answer is yes, I’m sure I could. I love the things you included. 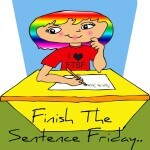 I completely missed Finish the Sentence last week…time is really getting away from me lately. Thank you for reminding of things I can and should be grateful for. Faith in God… A safe childhood… Chocolate… All important things we take for granted. Very thoughtful post. Loved your list Cori…little joys of life are the true blessings. Thanks for the reminder. Thanks, Balroop. Often we take the little joys of granted, don’t we? Wonderful list filled with gratitude. Lovely post, Corinne !!! What a wonderful list and idea! I love this! Such a great way to reflect on the positive things in life! Love how you combined this post with the prompts. Love also how you did 99 instead of 100. Mostly I loved the ones about family, but those about nature, writing, and all the things (luxuries) we are lucky t have were wonderful too. I especially focused on the one about a mentor and the following one on inspiration, as I have just recently found myself a writing mentor. You capture so much all in this one post. Nicely done. Thanks, Kerry. I would love to hear more about your mentor. Making a gratitude list cheers me up and I wonder at the immense amount of blessings that I already have in my life. Let us all be thankful and bring harmony to this world. Yes, I do believe gratitude lists make us take stock of our blessings and cause us to grumble less. And I can’t even come up with a list of 10! It’s so hard sometimes. Good for you. This is a fantastic list of things to be thankful for. It’s always the little things that you don’t think about too. Thank you for sharing them. Once you start, you can go on, Kimberly. Thanks for stopping by. Nice work you overachiever, you! So many items on your list would be on mine, too. From comedy shows to financial security, we seem to have lots of similar thankfuls. You’re so right. It’s a good reminder to come back to on days when I feel low. Thanks for visiting. Would love to read your list when it’s up. Coffee for sure! 🙂 And of course, a lot of the other things you’ve mentioned. We have a lot of overlap. Two loving parents, 50+ years of health, extended family, chocolate, imagination, thoughts, faith.m What a great list! So good to know, May. One more to make it 100….you!! What a wonderful, uplifting list. I love the public servant one. That one jumped out at me. This is really a great thing to–making a gratitude list. I’ve made lists of top-ten, but not 99! You’ve inspired me to give it a try for my next free write. Have a great day Corinne. This is great. I think gratitude is so important, and so many people focus on what’s going wrong in life. There are so many blessings we all have, and I believe the more we focus on things to be grateful for, the more things we get to be grateful for. What a wonderful, inspiring list! and you are so right, we often take these for granted. Thank you for reminding me. So many wonderful thoughts here Corinne. I am thankful daily for all of our modern conveniences and I always think of my ancestors when I’m doing the most mundane, everyday things, like laundry, cooking, dishes, turning on the faucet.. So much of what we have would have made their lives so much easier.. I am thankful and grateful. Glad you liked it, Ruchira. That’s a great list. 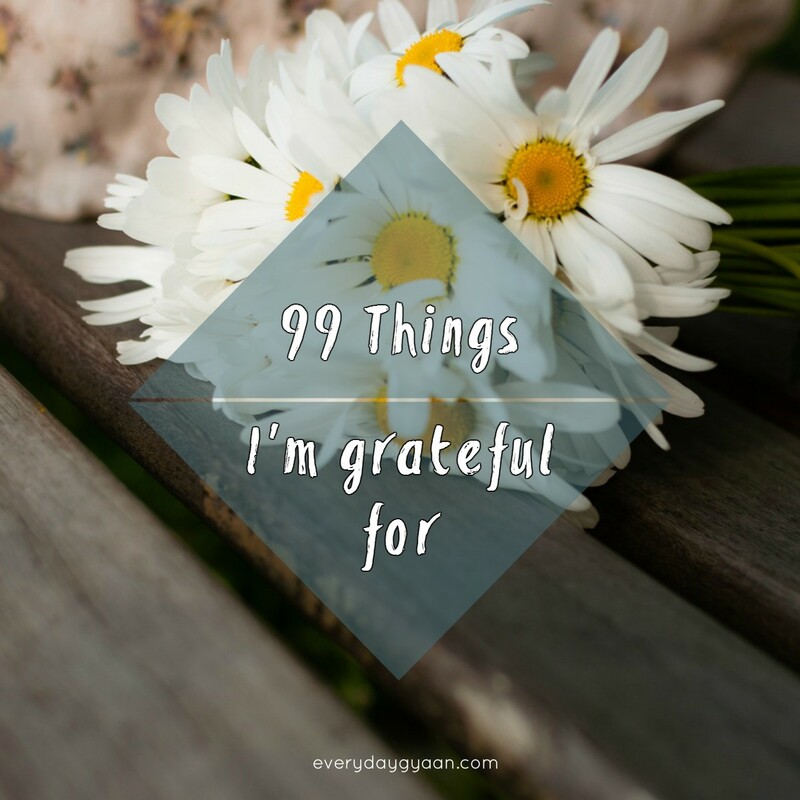 It shouldn’t be hard to think of 99 things to be grateful for but it seems like it would be a challenge to broaden your mind to complete the list because we take so many of these things for granted. Many of these be mine as well – even bubble wrap! This would be a great list for kids because they take a lot of granted too and don’t know to be grateful something as simple as a bed. I’m still learning to like cats..from afar, Katy. But I can see the appeal they have. What would we be without our pets? I actually came back from down the line to add that, although the list in not in order of importance. For me, it was a reminder of one of the things I take for granted! Wow! Such a lot of thought went into this lovely and imaginative list. Well done. I grinned when I read the “washing machine” reference. You reminded me of the conversation I had on the soccer pitch with one of the player’s Italian grandfathers. A mother and I were nattering on about how much work awaited us at home once the game was over. He looked at us and said “Yes, but think how much more work you’d have if you didn’t have a washing machine. Imagine going home now and lugging the dirty clothes down to the river …” Stopped us cold. How very true. I have lived in India my whole life. It’s hard for my generation to take for granted washing machines and whole lot of other conveniences since we didn’t have them growing up.